Womb Walks was our first collaborative practice as a collective in 2011 when Barbara, Nané and Medwyn each walked and sometimes made labyrinths on each of our birthdays, walking simultaneously at a distance from each other with the intention of supporting a rebirthing experience on these anniversary days of our birthing from the womb into this life. As individuals and as a collective we have wit(h)nessed many changes in the intervening six years. As we held space for each of our voices during our August 2017 retreat, we recognized a theme of re-emergence for the Collective. Barbara's completion of her work at an American state university in Carbondale, return to Canada and to Calgary a place of her early years as an artist; Medwyn's new directions in life and relocation to an urban environment in Victoria; Nané's completion of her post doctoral work, with life shifts back into grassroots work as her daughters grow up, and Cindy-Lou's realignment of focus and time with work and family, all reflected a sense of change and renewal. 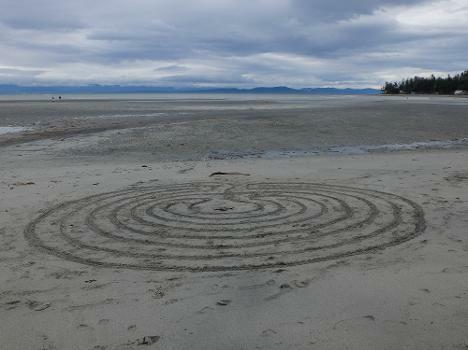 We found ourselves wanting to honour these changes through re-engaging with our womb walking practice thus opening space for the rebirthing of ourselves individually and as a Collective. Womb walks will be created in December for Cindy-Lou, February for Nané, March for Barbara, and May for Medwyn.